Today we're introducing an occasional feature spotlighting MSU alumni clubs around the nation. They're the first friends a Spartan has in a new town, folks who share a timeless bond even though they may have just met. So with that in mind, we wanted to focus on some of MSU's alumni groups during the dog days of summer, so those of you outside mid-Michigan can get an idea of who you'll be watching football with this fall. 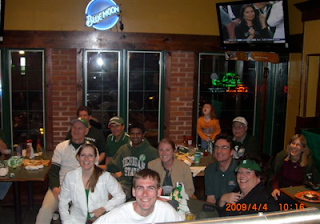 First in the series is the MSU Alumni Club of Maryland, my local chapter. Geographic reach: All of Maryland north of the Washington D.C. Beltway, but particularly in the Baltimore area. Home base: Greene Turtle restaurant, Towson, Md. Towson is an affluent suburb of Baltimore, located about 20 minutes north of the city. Think Birmingham, Mich., compared to Detroit, and you're not far off. Active membership: Big-time football games and the Final Four drew between 30 and 50 people this past school year. Members' ages range from recent grads to retired, with no one age group dominating. The club's Facebook group has 42 members. Activities: Viewing parties for every football game and the biggest basketball games, including the NCAA Tournament. The annual Detroit Tigers visit to Camden Yards to face the Baltimore Orioles is always a big draw. Traditions: During football viewing parties, one member leads the club in the fight song after every MSU touchdown. Usually fairly loudly. Fun fact: The Maryland alumni club of the University of Notre Dame also meets at the Greene Turtle in Towson. MSU had about 40 people there during the MSU-Notre Dame game. The Irish had four. If you'd like us to feature your alumni club in a spotlight, just let us know.